Anonymous. 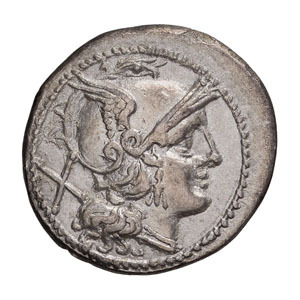 Denarius, 3.93gg. (6h). . , from 211 BC. 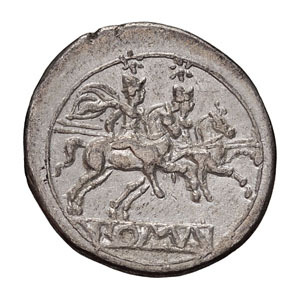 Obv: Helmeted head of Roma right, value mark X behind. Rx: Dioscuri galloping right holding spears, each with star above head, ROMA in relief on tablet below. Crawford 44/5. EF. Ex Berk 167, 3 December 2009, lot 198.